Maybe its because I have lived at the beach for much of my life but nothing says 4th of July or "summer is here" like s'mores! 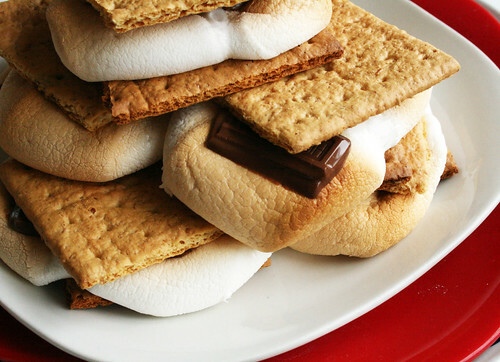 S'mores are one of my favorite treats and I can remember sitting on the beach around a bon fire, assembling graham crackers, marshmallows and chocolate while watching fireworks. To this day every time I eat them I am transported to summer, to memories, to childhood. A bon fire or camp fire is not always accessible but you can still enjoy this mouthwatering treat by baking them in the oven- thank goodness! I will be serving them this weekend on a platter, as dessert for the 4th of July festivities at our house. 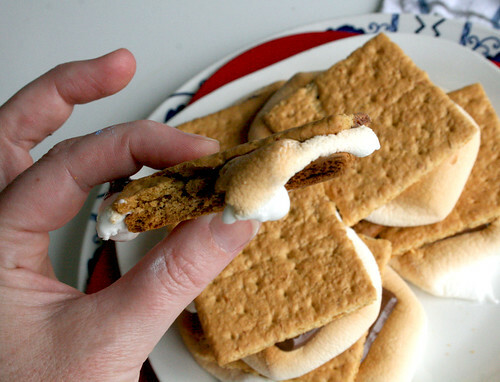 Start by laying out graham crackers on a cookie sheet and place 1-2 marshmallows on top of each. 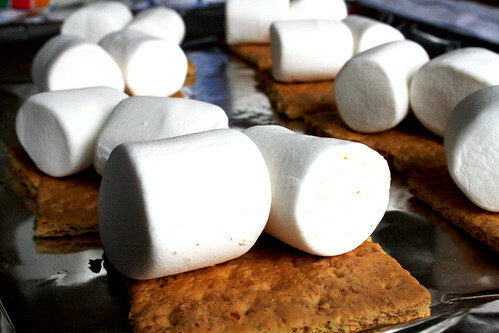 Place into the oven set at 400 degrees and bake until the marshmallows are crispy brown- around 3-5 minutes. 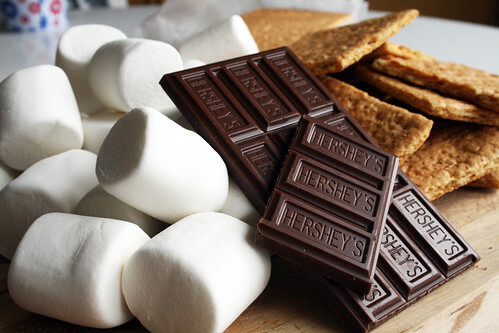 Place pieces of chocolate on top of the hot marshmallows- the heat will melt the chocolate. Stack on a plate and serve warm. And enjoy every single second gobbling up this warm and gooey treat- YUM-YUM-YUM! 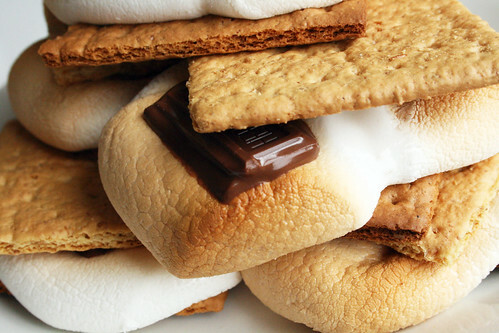 We love s'mores and I never thought to make them in the oven. When we had a gas range we just cooked the marshmallows over the flame but since we moved we have been doing them in the microwave. I'm going to try the oven method right now! This is great! I just made S'mores this evening for my son (his first!!) and we made them in the microwave because we ran out of time to make a fire. I never thought about using the oven. Thanks for the post. 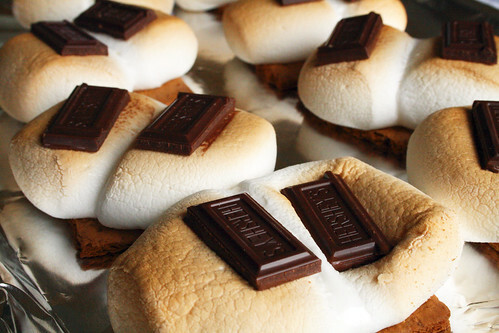 Such a clever idea to make s'mores in the oven. I sure will beat my candlelight s'mores when the kiddos are around. Thanks for the tip! Wow! Are those triple deckers? 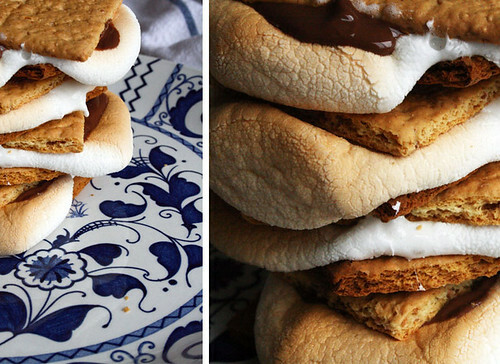 Is there really any such thing as too many s'mores? These look amazing! Looks fab! 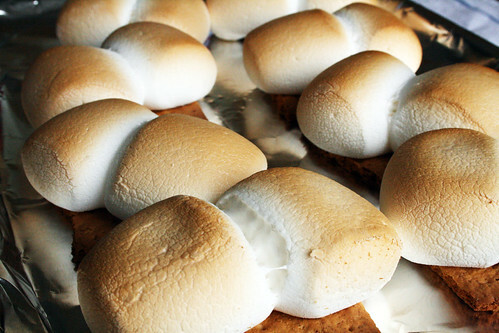 Smores are one of my favorites too... and now we can have them all the time straight from the oven! You've just made my son very happy. Thanks for the great idea. I need to take dessert for 30 people Sunday night and I think this will be it... especially because there'll be 6 teenagers from Kazikstan attending and they need to taste an all American 4th of July tradition. um, i'm making this. you know you have a fabulous recipe when i'm scouring my pantry for ingredient, + mad +i have to wait until tomorrow. these look great. Alisa I have done this exact same thing, except I put my broiler on for a minute or two. MMmmmm, looks like Summer time. Makes me want to drag out the camping gear. Good idea! We have done it in the microwave before, but you miss out on the brown parts. I am going to have to do this! Thanks for sharing. oh my goodness! I never would have thought of this. sweet. and I really mean it.! I made these tonight and my boys loved them! thanks for the inspiration! i made my own australian version of these today and they were fantastic!!! Great idea. I have a box of graham crackers left over from camping this weekend. definately trying that, never thought of it! nice! big smores fan here, i even made smores earrings! check em out! My kids had a cooking competition tonight! We used this recipe. Thanks! Since last year I have living in Buenos Aires in a 4rent Argentina department. Last month my mom came to visit me and I prepared this recipe, I was really fantastic!! !